Did you know? 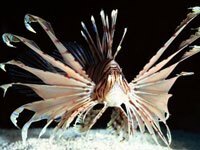 A lionfish will often spread its feathery pectoral fins and herd small fish into a confined space where it can more easily swallow them. What does a lionfish look like? 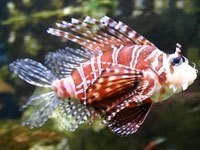 Pretty much everything about the venomous lionfish—its red-and-white zebra stripes, long, showy pectoral fins, and generally cantankerous demeanor—says, "Don't touch!". The largest of lionfish can grow to about 15 inches (0.4 meters) in length, but the average is closer to 1 foot (0.3 meters). 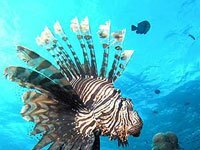 Lionfish, also called turkey fish, dragon fish and scorpion fish, are native to the reefs and rocky crevices of the Indo-Pacific, although they've found their way to warm ocean habitats worldwide. 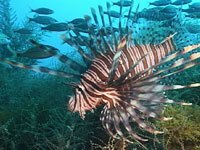 What does a lionfish eat? The venom of the lionfish, delivered via an array of up to 18 needle-like dorsal fins, is purely defensive. It relies on camouflage and lightning-fast reflexes to capture prey, mainly fish and shrimp. 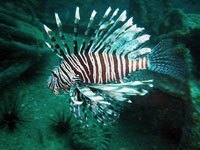 A sting from a lionfish is extremely painful to humans and can cause nausea and breathing difficulties, but is rarely fatal. 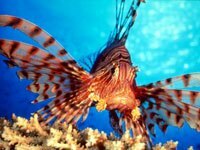 How does the lionfish protect itself? If attacked, a lionfish delivers a potent venom via its needle-like dorsal fins. Its sting is extremely painful to humans and can cause nausea and breathing difficulties, but is rarely fatal. Download free Lionfish wallpapers, click on the image to open the large version. Print free Lionfish coloring pages, click on the image to open the large version.